University of Lynchburg assistant professor of Spanish and author Dr. Pedro Larrea will read from his work at the first Thornton Reading event of 2019. 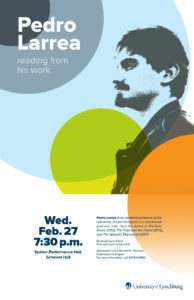 The reading will begin at 7:30 p.m. on Wednesday, February 27, in the Sydnor Performance Hall in Schewel Hall. This event is free and open to the public. Dr. Larrea earned his MA and PhD in Spanish from the University of Virginia after earning degrees in literary theory and comparative literature from the Complutense University of Madrid in Spain. He is a poet, an essayist, and a translator. Dr. Larrea has published three books of poems: The Free Shore (2013), The Tribe and the Flame (2015), and The Wizard’s Manuscript (2017). His poetry also has been featured in the Spanish journal, Revista de Occidente. Dr. Larrea has read his poetry at the Library of Congress in Washington, D.C.; the New York Public Library; New York University; and the International Poetry Festival of Granada, Spain. As an essayist, he authored the scholarly study Federico García Lorca en Buenos Aires (2015), and as a translator, he published the Spanish edition of Kevin Young’s Book of Hours. Dr. Larrea will be reading from his most recent poetry collection, The Wizard’s Manuscript. This book of poems follows a nameless narrator. Hungry and hoping for spells to conjure bread, he finds himself instead enchanted by the fragmentary story. This collection of poems invites the reader to share the narrator’s experience of self discovery. Dr. Larrea also will read a few short poems from the American edition of his first book, The Free Shore, which will be published this year. The Thornton Writing Program, named for Richard H. Thornton, a graduate from the Class of 1907, has brought successful poets, novelists, dramatists, and nonfiction writers to the University of Lynchburg since 1975.